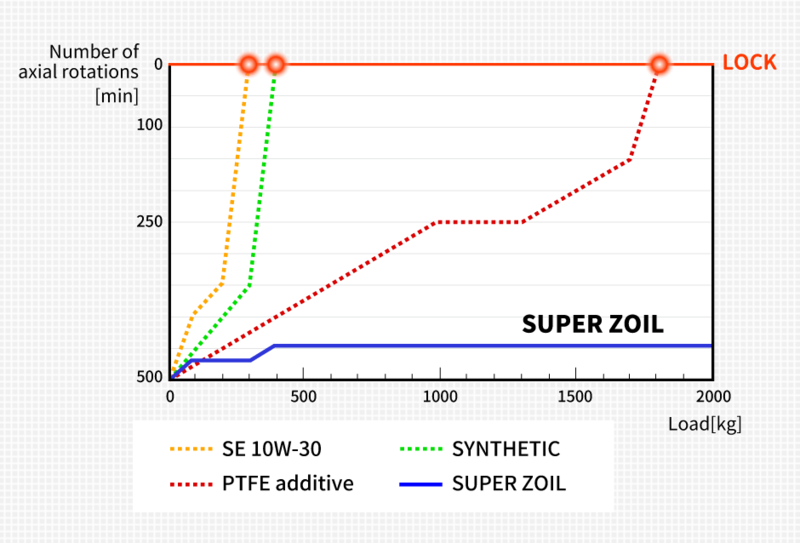 The test data of SUPER ZOIL's lubricant functionality are shown below. This value indicates the action to neutralize oxidized oil. The high value is the indication of higher oxidation resistance. Chlorine is a natural substance and thus any type of oil contains this at ppm level. Parts per million (ppm) is a commonly used unit of concentration. For example, less than 50 ppm indicates a content of less than 0.005%. So called, "chlorine additives" contain 10 to 19% chlorine, which represents a chlorine concentration 100,000 to 200,000 times higher than the usual level. SUPER ZOIL does NOT contain chlorine that would cause corrosion to metal surfaces. This is the test in which burning/damage resistant effect is measured under "excessively pressurized environment", where metal friction level is extremely high that it may cause lubricant membrane to break off. For SUPER ZOIL, any burning or damage to the metal was detected under maximum pressure created by the testing machine. Therefore, the result is shown as incapable measurement (3000lb or more). The results of conventional additives are 500 to 1000lb. This is the pressure resistance test measured by pressing a test piece of bearing material against the rotating motor axis, and gradually increasing the load. With just engine oil, or with conventional additives, rotating motor axis is locked (zero rotation) once the high load is applied. With SUPER ZOIL, it does not come to a lock even at a high load of 2000kg/cm2, indicating the high durability as well as lubricity. Moreover, this effect continues even after the oil is removed. In the conventional physical and chemical characteristic test, the total base value is large, which indicates that the anti-oxidation characteristics of oil are improved, the soda four-ball type test (step method) reveals that oil mixed with SUPER ZOIL has twice the lifetime of the original oil. Moreover, the wear scar diameter is a half that of the original oil, the coefficient of kinetic friction also reveals the beneficial effects of SUPER ZOIL. The addition of SUPER ZOIL to lubricating oil further improves the effects on such physical and chemical characteristics as extreme pressure, wear prevention, and lubrication without losing the inherent lubricant performance. Test Tube Method: Submerge a polished copper test strip in approximately 30mL of test liquid for the specified time. SUPER ZOIL belongs to 1a, which is the highest level, thus proving that SUPER ZOIL does not corrode metals. Measurement Condition: The measurement was conducted for 12 hours a day to compare the power consumption before and after SUPER ZOIL use. According to the data on the leftup, the application of SUPER ZOIL reduces the annual power consumption by 15%.